You are viewing the archived 2014 ratings for toilet paper. Go to the current toilet paper ratings. Our latest awards endeavour to empower consumers with the knowledge of which brands to pick up when shopping. If you’re wondering the aisles in search of the best toilet paper, we’ve got you covered. When compared alongside eight other toilet paper brands, Quilton, who produce a variety of toilet tissue products, received our Everyday Essentials for 2014 in this category. Also compared were Sorbent, Kleenex, ALDI Brands, Safe, Naturale, Woolworths Brands, Purex, and Coles Brands. Canstar Blue commissions Colmar Brunton to regularly survey 2,500 Australian consumers across a range of categories to measure and track customer satisfaction. 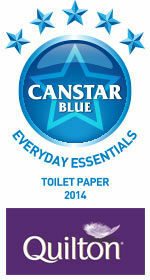 The outcomes reported in these Everyday Essentials Awards are the results from customers within the survey group who have purchased and used toilet paper in the last three months – in this case, 2,198 people. Brands must have received at least 30 responses to be included. Results are comparative and it should be noted that brands receiving three stars have still achieved a satisfaction measure of at least six out of 10.